Thank goodness these characters and the basic details of their lives had already been introduced before in Campbell’s novel, Looking for La La. Starting with the sequel had produced an experience akin to stepping into a room where a rollicking conversation peppered with inside jokes was already well underway. Though I argue the aptness of the adjective “standalone”, I finally was able to relax and enjoy Campbell’s witty style of writing. The actions and attitudes of the central character, Cath, and those of her entourage of friends and family, often required me to put common sense on hold, but such is often the case with British humor, which I tend to adore. While To Catch a Creeper, might not be the most crafty of whodunits (I guessed the identity of the creeper when the character was introduced), it is enjoyable summer beach reading. 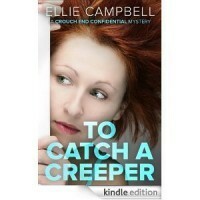 I was slightly awed to learn “Ellie Campbell” is actually the pseudonym for sisters, Pam Burks and Lorraine Campbell. The two construct their books mainly through phone calls and Skype sessions between their respective homes in Reigate, Surrey and Boulder, Colorado. Often, I struggle to crochet together my own thoughts when I am writing; I cannot imaging trying to merge two minds to develop nearly such a tidy plot with so very few loose ends left to niggle at the mind of the reader. This entry was posted in Book Reviews, Writers and Writing and tagged book reviews, crime, e-book, Ellie Campbell, mystery by Heather. Bookmark the permalink.